In my previous blog post I went over what Regardie's The Golden Dawn had to say about the Tattwas and Tattwa cards. If you have the book, you may think I forgot to mention Volume IV Book Seven: ADDITIONAL LECTURE ON THE TATTWAS OF THE EASTERN SCHOOL. As to whether it accords with the general content of the rest of the Order system must be left to the discrimination of the individual student. That it has several points of value will be doubted by none, though few will care to subscribe to the paper in its entirety. Personally, I feel it to be definitely an alien system, which touches the Order teaching in but very few places. The mode of skrying in the Spirit-vision using the Tattwa symbols is sound enough and has been described elsewhere. But other aspects suggest that the two systems are not likely to mix particularly well. The U.S. branches of the Golden Dawn used this material. I have also seen how the Whare Ra temple of New Zealand rewrote the material for their audience and I like that a lot. Regardie in his work mentions how this additional lecture is based on the Theosophical work Nature's Finer Forces, or the Science of Breath by Rama Prasad. Although I had read Regardie's note on this lecture many times over the last two decades, it was only while writing the last blog post that I decided to look up Rama Prasad's original work. As it turns out, you can find it online at archive.org. Click HERE to download it or read it online. You can read the original work and make up your own mind if it fits the Golden Dawn material or your own personal practice. I have only skimmed the book and can see how Regardie formed his opinion of the book and lecture. Prasad's book is interesting and shares much in common with other Indian works. The concepts seem so foreign to the rest of the Golden Dawn material that I wonder how it became so popular. I couldn't care less whether Nature's Finer Forces is in accord with the other Golden Dawn material. It was taken seriously by the original Golden Dawn members and it shows us the theoretical framework used by the Theosophical Society and the Golden Dawn in their approach to the Tattwas and the Tattwa symbols. Although there is a lot of material to be read, it is the description of the Tattwa shapes and colors I find most interesting. Akasa (Ether) is black or "no color" and is shaped like the opening of an ear, an oval, or an egg. Vayu, the Aerial principal is a green or blue circle or sphere. Tejas, the principle of Fire, light, and heat is a red triangle. Apas, the Watery principle is a white (or all colors) crescent with its two points up. Prithivi, the principle of Earth is a yellow square. The variations in the colors of the Tattwa symbols for Apas, Vayu, and Akasa are not a result of confusion or uncertainty on the part of Rama Prasad or the members of the Golden Dawn. The Tantras also contain variations in descriptions of these Tattwa symbols. The summer before I entered high school was a rough time. At night I found myself transported to strange places. A couple times I flew in seconds to India. One night I was summoned to witness a graveyard ritual and not dismissed until it was done. Many nights I would wake from dreams to find I could not move, but there were ghosts and demons around me. These were just some of the strange things happening to me every night. I had experienced things like this as far back as I could remember, but that summer was special. Four to six times a night, every single night, my mind was bombarded with the most bizarre experiences. So I went to the library. I read books on dreams and astral travel and the occult. I read books by Colin Wilson and Richard Cavendish. I read Aleister Crowley's Magick in Theory and Practice. I also went to the bookstores at the mall near my library. There was a corner of the store, near the back room, that could not be seen unless you approached it the right way from the last aisle. In the strict sense of the word, it was an occult location within the store. This is where the books on magick and the occult were kept. I would go to that bookstore and sit in the corner for an hour or two at a time and read. Then one day there was the biggest, prettiest book I had ever seen. And it was packed with occult lore and strange diagrams. I had to have it! But I was too young to have a job. I would beg money from my mom. I would tell her it was for soda and hot dogs. I ended up begging and scrounging enough money that summer to buy Israel Regardie's The Golden Dawn (and about a half dozen other books). I still have the book. It is worn at the corners and edges from too much travel in a backpack. Parts of it are held together with invisible tape and it is filled with notes on Gematria. The Golden Dawn was my introduction to occult practices I might actually use, and I know I am not the only person who can say that. So, I think it only right to start this blog off with a summary of what was written in The Golden Dawn about the use of Tattwa cards. 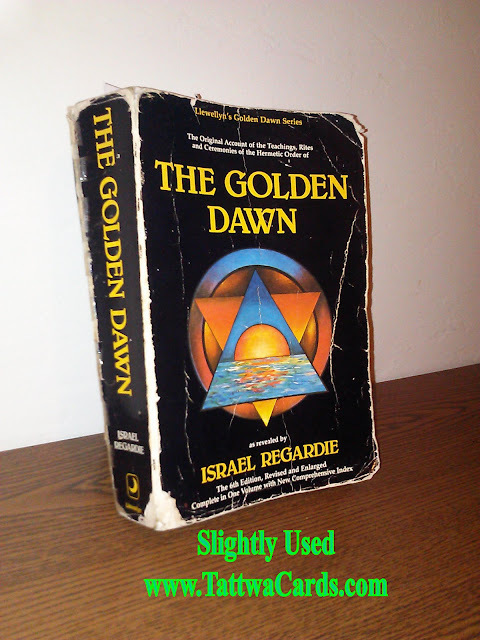 Volume Four, Book Seven of The Golden Dawn begins with a section titled "CLAIRVOYANCE". Regardie notes that "this paper is compiled from several unofficial documents which were not sufficiently interesting to publish in unabridged form by themselves." This is a strange situation since Regardie states earlier in the book "It may be interesting for the psychological critic to reflect upon the fact that it was this technique to which most members of the Order devoted the greatest attention--the onlytechnique in which, more than any other single branch of the work, there is greater opportunity for deception and self-deception." One would think that the one technique which most members of the Order devoted the greatest attention would have the largest, clearest, most well written section or lecture. It doesn't. In this section the reader is given instruction on the names, symbols and colors of the Tattwas. Symbol: black or indigo egg. Symbol: a sky-blue disc or circle. Symbol: a yellow square or cube. The Tattwas presented here are those of Samkhya philosophy and are very similar to the classical elements of western philosophy, magick, and alchemy. In brief, the traditional occult concept of the Tattwa is that of a vital current of ether or force -- the Hindu Pranas-- which issues in a steady stream from the Sun. That stream is five-fold, and flows around our earth, vitalising its astral substance or its sphere of Sensation. In short, they are the currents of sub-planes of the Astral Light. The theory has it that the Element of Akasa is strongest at dawn, when the Sun Rises, and its power continues for the space of two hours, when its force subsides and glides into Vayu, Air. This also persists or is in course for the same period. Each Tattwa or current of force is believed to exist strongly for this length of time, each merging at the end into the suceeding Tattwa in the order given above. After the current of Prithivi is exhausted, the cycle recommences with Akasa, and continues in the same order again and for the same periods. Tattwas were not just symbols used on cards. Tattwic tides were considered also when working with elemental forces. A good example of an occasion to consider Tattwic tides is in the consecration of elemental weapons. 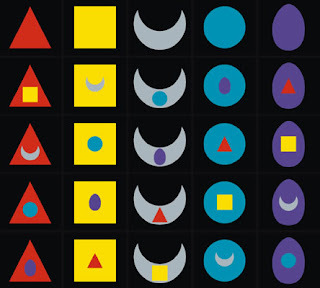 The section on clairvoyance describes how to make your own Tattwa cards and then how to use them to develop clairvoyance. The book suggests cutting the shapes out of colored paper and pasting them to white cards length upwards. A basic method to using the Tattwa cards is to hold one before you and gaze at it while meditating on the qualities of the Element. Then close your eyes. You will see an afterimage of the symbol. Imagine this growing larger and becoming some sort of doorway which you can pass through. Pass through the door and feel it close behind you. Explore the place you find yourself in. Pass back through the Tattwa portal back to normal consciousness. The Golden Dawn placed much importance on "testing" the world and its inhabitants using Hebrew godnames, names of angels, and the Signs of the Grades of the Order. Also, it was assumed there would always be a "guide" on these excursions. Several days between each attempt is recommended, especially for a beginner. Immediately following the section on clairvoyance is a section titled "OF SKRYING AND TRAVELLING IN THE SPIRIT-VISION" by V. H. SOROR, V.N.R. This was a Golden Dawn Flying Roll. That means it was something someone in the Order had written that was circulated by mail. The method of this section is a more ritualized version of the section on clairvoyance. You can read Flying Roll XXXVI over HERE. I hope you have enjoyed this summary of what is written about the Tattwas and Tattwa cards in Regardie's The Golden Dawn. In future posts I hope to go into greater detail about every aspect of Tattwas and Tattwa Cards. Copyright Jason Bales (Brother Enoch). Powered by Blogger.